Nothing sounds better than an afternoon lounging on St. John’s gorgeous beaches. But did you know that hiking is actually one of the most popular activities on St. John? St. John Island hiking trails offer adventurers of all skill levels views of the lush landscape, cascading waterfalls, rocky shorelines, and sandy stretches that capture the true essence of our island. The Virgin Islands National Park is actually home to over 20 trails worth exploring on your next visit! The next time you are up for St. John hiking, check out this guide to six excellent trails. For more information on where to go adventuring in St. John, download our Mobile App on your Apple device or Android device! It includes some St. John hiking trails that you will love. If you are in search of an easy walk with no hills, check out the Drunk Bay Trail. This quarter-mile walk opens up to the rocky shores of Drunk Bay Beach. Along the trail, you’ll see wild orchid-lined paths. You might even come across a donkey on your adventure. Once you reach the beach, take in gorgeous views and look for rocks along the shoreline. Another trail that is fairly easy to navigate is the Lind Point Trail. This St. John hiking trail leads to both the beautiful Honeymoon Bay and Salomon Bay Beaches. The highest point reached along the trail is 160 feet at the Lind Point Battery Overlook. Find a bench along the trail to rest and soak in the beauty of the Cruz Bay harbor. The more experienced hikers will enjoy the Cinnamon Bay Trail. The beginning of the trail starts off with a steep hill. After a strenuous hike up the hill, find the flat rock that makes a perfect bench for relaxing and catching your breath. Along the trail, you’ll see bay rum trees and a variety of fruit trees. The Cinnamon Bay Trail is 1.1 miles and mostly woodsy and shaded. Once you reach Centerline Road, head left and you will meet up with the Reef Bay Trail. The Reef Bay Trail on St. John, which is Virgin Island National Park’s most popular trail, offers two different expedition experiences. If arrangements are made in advance with the National Parks Service, hikers can stride down the trail and then have the Sadie Sea boat charter give them a ride back to Cruz Bay. For more of a challenge, hikers should park at the trail head on Centerline Road, hike down, and then climb back up. Along the Reef Bay Trail, hikers will have the opportunity to see sugar mill ruins, deer, petroglyphs, and a 40-foot marvel among St. John waterfalls. The petroglyphs are decades old and said to have been carved by the Taino Indians! These carvings can be found near the freshwater pools at the base of the waterfall. At the bottom of the trail, take a dip in the ocean at Reef Bay to cool off. The Johnny Horn Trail is a 1.8-mile trail with steep hills up to 400 feet. The steep incline is worth it to see the incredible views and historic ruins. There are five spur trails off the main trail. The first side trail leads to a great snorkel spot at Watermelon Cay. Hikers should keep an eye out for aloe lining the trail and the ruins of an old Danish guardhouse on Leinster Point. After you’ve explored St. John hiking, be sure to return each day to a CimmaronStJohn luxurious vacation rental. 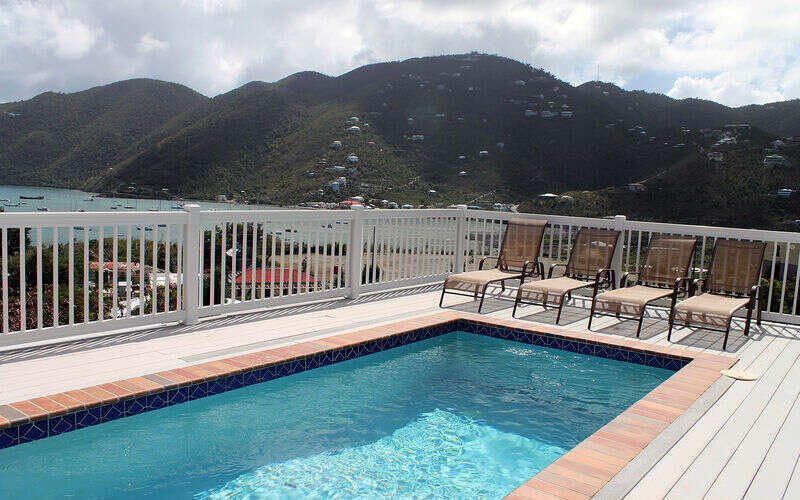 All of our villas, condos, and homes include breathtaking views of the beautiful, blue waters surrounding St. John. To start planning your getaway to St. John, give us a call at 340-715-2666. One of our elite guest services experts is ready to help you plan the vacation of your dreams!